Subtlety and boldness meet in this Smoky Quartz and Diamond Cocktail Ring in 14K White Gold, creating a look that's undeniably glamorous. A sizeable stone with a rich, earthy hue and gentle glimmer stars in this statement piece, accompanied by over a third carat of glittering diamonds for a look that's both understated and upscale. 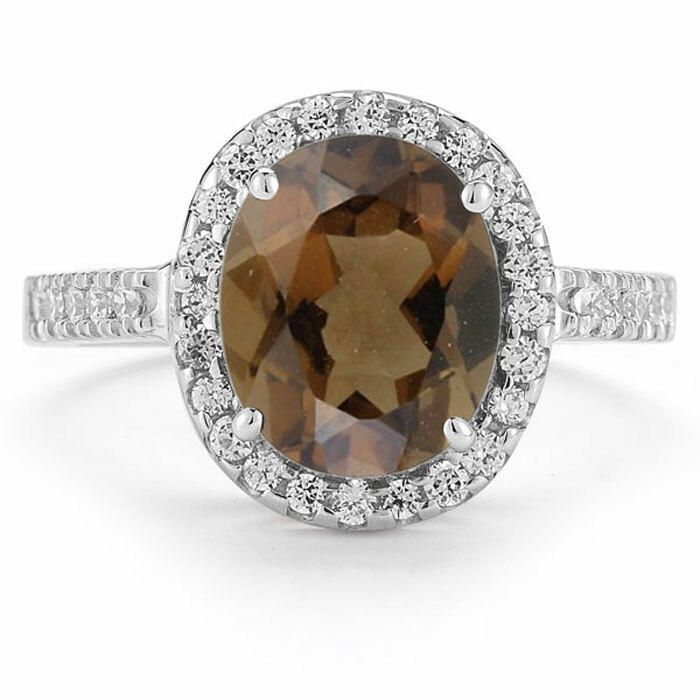 The smokey quartz that glimmers from the center of this chic style is a unique gem that finds its beauty in its subtle hue and lovely glimmer. As its name suggests, the color of this gem calls to mind a curl of smoke rising from an autumn bonfire. This soft brownish hue is warm but never overpowering, allowing it to complement a wide range of looks. At 10mm high and 8mm wide, this oval-shaped semiprecious gem is a sizeable stone that adds a touch of warmth at any time of year. A total of 34 diamonds serve as accents to this smokey quartz, two dozen of which form a sparkling frame around it and gently reflect its hue. Five additional diamonds glitter on each side of the center stone, glimmering upward from the shining band. Crafted from cool 14K white gold, this band provides a fitting foundation for this daring but versatile piece. 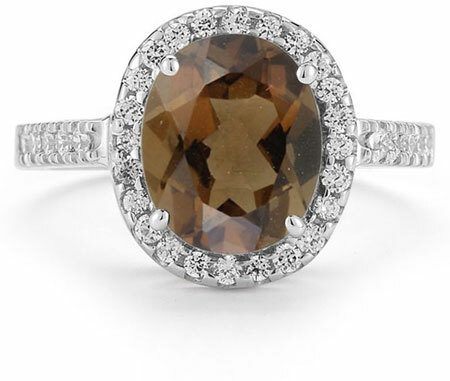 We guarantee our Smoky Quartz and Diamond Cocktail Ring in 14K White Gold to be high quality, authentic jewelry, as described above.